Dogs are great travel companions, and anyone who has been a pup with their head out the window, ears flapping in the breeze, knows how much they enjoy it. That being said, as fun as a road trip with your furry friend in tow can be, the car poses safety risks to them, just as it does with humans. Fortunately, with the right precautions, it is perfectly safe to bring your precious pet with you on the road. Here are some safety tips to keep in mind when you have your dog in the car with you. You wouldn’t let your human passengers ride without a seat belt, so why would you let your canine companion? The safest way to transport your pup is with them fastened in their own seat belt. You might feel silly strapping in your dog, but in the event of an accident, a seat belt can make all of the difference in the world. You can find dog seat belts at pet stores or online. While some pets make incredibly calm copilots, other dogs have more anxious dispositions. For these poor pups, a car ride can be overstimulating. If this describes your dog, you might elect to crate them during the journey instead. Crates provide your dog the safe protection they need while giving them their own space. This familiar place can be the comfort they crave on a long journey, particularly if you cover it with a blanket to block their view out the window. Some dogs love riding shotgun, but not all of them can handle it. If they are anxious or overly excited, they might try to climb all over you, which poses obvious safety problems. Fortunately, it’s possible to create a barrier between the back and front of your cars to prevent antsy dogs from disrupting your driving. Which method is best will depend on your specific car model, but there are fences made specifically for this reason for hatchbacks, SUVs, and vans. Just make sure the barrier fully prevents your pup from slipping through. When you are on the road alone, you might try to power through without making many stops, but this strategy doesn’t work when you have a pup in tow. Make sure that you give your dog many potty breaks, as well as time to stretch their legs, drink some water, and eat their meals at their regular times. How often you should stop depends on how old your dog is and their own personality and energy levels, but in general, you should stop at least once every two hours. If for any reason, you have to leave your dog in the car, make sure you have assessed the temperature. Even on mild days, the temperature in your car can get significantly hotter. For example, on a 75-degree day, your car can reach 100 degrees! Sitting in a hot car, even if the windows are cracked, can give a dog heat stroke, which can be fatal. In addition, it is actually illegal in some places to leave dogs in cars. Bring your dog with you whenever you can. We know we mentioned above how much dogs like sticking their heads out the window, but this actually is not safe for them to do, particularly if you are traveling at high speeds. Debris can irritate their eyes or objects can fly from other cars and injure your pet. It’s better to play it safe and keep the windows closed on your road trip. 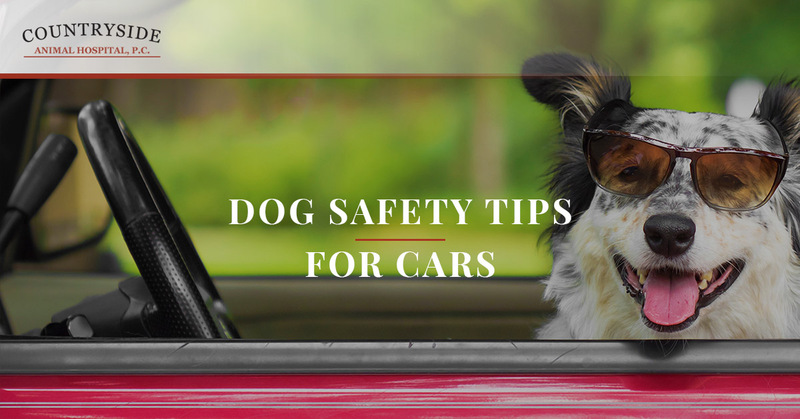 We hope that these tips help you keep your furry friend safe on the road. If you’re in need of a veterinary clinic in Fort Collins, we can help! Contact us today to schedule an appointment.